While we grieve, we tend to let it take over every waking moment of our lives. Our quiet times become filled with grieving moments, our journals become stuffed with grief-ridden sentiments, we allow this emotion to go unchecked and run wild. This rampant emotion tends to take control of every thing in our lives, or even worse, we ignore it. Why? Why is this awful emotion allowed to bulldoze our lives? This month will always be a difficult month for me. Specifically, today. On April 3rd, 2011, my dad passed away suddenly, marking that day to live down in grieving history for me. Never in my life have I experienced such a great loss. Even after 7 years, that grief still manifests itself in some way, and probably, always will. Time was the biggest factor in healing, but there were so many opportunities where I failed myself and did not keep this emotion in check. During this time, I kept myself busy all the while sweeping this emotion under carpet after carpet. I became so weighted down by this constant looking the other way that I let this emotion run my life. I felt powerless and looking back, I wish I would have just acknowledged it. But I was scared. As with most emotions, fear tells us that everything’s fine. Everything’s a-okay, don’t worry about it, you’re supposed to feel this way. What fear doesn’t tell you is that you’re letting an emotion break you down day after day. Seven years ago, I didn’t know what self-care was in a normal routine, let alone what it was like when I was in full-fledged grief. Self-care during grieving times are crucial for acceptance and learning to rebuild. During grief, we tend to feed it. It consumes us and takes over if we let it. 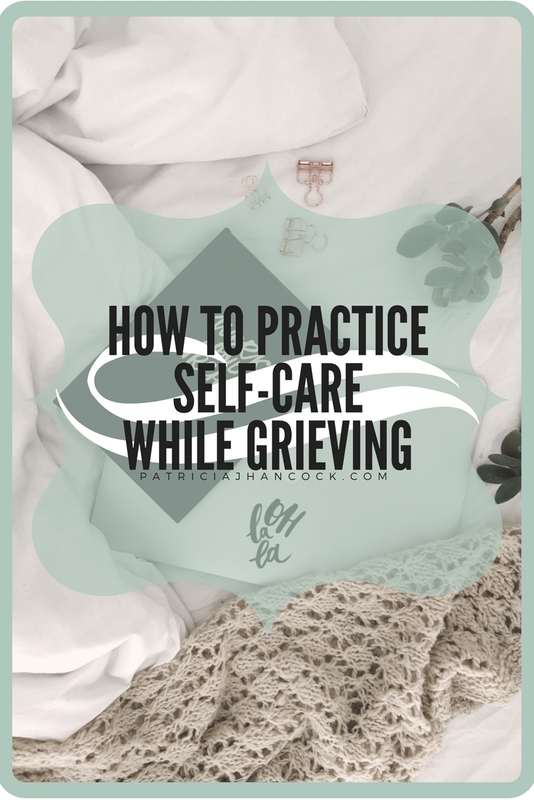 Today we will be going over how you can make time for grief and what self-care looks like during this difficult time. The biggest first step is the actual acknowledgement of the emotion. When you single out this emotion, we begin to see how many tethers this emotion has to other, secondary emotional responses. That anger or frustration you felt at something small? More than likely amplified by grief. When you single out this emotion, you can begin to heal yourself and accept this emotion by looking inward. These inner questions begin to ground yourself back to the true you. Tethering yourself to living intentionally will help ground this emotion and become easier to accept and acknowledge it. Setting aside time for yourself to acknowledge grief is one of the best ways to honor the emotion and take care of yourself in the process. If you keep yourself busy and avoid it, this emotion will snowball and get worse. Writing down your thoughts is one of the best ways to soothe a grief-stricken heart. Sometimes you’ll find yourself so paralyzed by grief that even the thought of writing something may be overwhelming. And there are times where there’s nothing to say. Every day, write down two sections or page: a section/page for grief and a section/page for you. What does this look like? These prompts are to encourage you to keep a focus on who you are, rather than you-during-bereavement. During this time, it's easy to lose sight of yourself and become grief, so tethering yourself back to those core values you set for yourself are crucial. With any big emotion, quiet moments are essential for understanding and accepting grief. With your acknowledgement of grief, making time for yourself without the emotion running the show is crucial in finding yourself under the emotional burden. During your quiet moments, focus on how grief has impacted it in a positive light. What did you learn about yourself during this time? How has this made you stronger? Focusing on your progression and development as a person reels grief back. This also takes the power away from letting this emotion run rampant without any restraints. Along with journaling, letting your creativity release the pent-up grief can be a major milestone for your journey. Maybe you’re a crafter, or maybe art is something you’ve always wanted to try. A creative release is a must for any stage of your life, but this simple hobby can help you release emotional tension by focusing your right-brain into producing, rather than rationalizing with the left. Finding someone to confide in and just have them listen can be the biggest self-care. Especially for extroverts who look outward for their emotional care. Setting aside time to spend an afternoon with a loved one outside of your home can lead to the biggest break-throughs when it comes to grief. Getting this emotion out and hearing another perspective from someone who isn’t grief stricken can help you rebuild. During these conversations, you’re not necessarily looking for advice. You’re looking for reassurance and support for your emotions and grief. Although the building blocks of self-care are there, the shape change a bit when you are grieving. It’s hard to get into a self-care routine when you’re not mentally prepared, but the key is progression, not perfectionism. Any step towards taking care of yourself is still a step towards what you want. Grief can lead to many gifts we did not know we had inside of us. You can begin to see how strong you actually are and begin to realize that you are truly in control of yourself and your emotions.